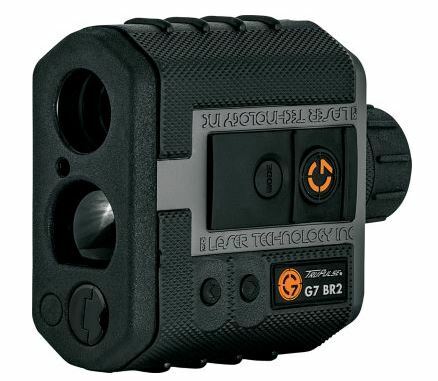 Gunwerks G7 BR-2 Ballistic Rangefinder 2,500-yd. maximum range and 7X magnification Computer compensates for wind, angle, temperature and altitude Program up to five profiles unique to your cartridge and firearm Choose between BDC, MOA or inch readouts Four targeting modes enhance detection in tough conditions Weatherproof GORE-TEX membrane protects the rugged housing Sight targets in any weather out to an amazing 2,500 yds. with Gunwerks G7 BR-2 Ballistic Rangefinder. With a built-in ballistics computer that compensates for wind, angle, temperature and altitude coupled with improved ranging and targeting algorithms, tighter beam divergence and more precise ranging, this rangefinder proves ideal for any long-range shooting situations. 7X magnification brings targets into clear view for accurate calculations. Simply press a button to measure conditions based on a programmed ballistic coefficient, muzzle velocity, sight height and zero range. Use BDC, MOA and MRAD outputs with any scope's adjustments to dial in angular solutions. Programmable for up to five ballistic profiles unique to your cartridge and firearm. Easily select a firing-solution readout between BDC, MOA or inches. Sync the rangefinder to your exact ballistics with BDC mode by inputting the altitude and temperature that the turret or reticle was built to match so the computer can automatically calculate adjustments based on current conditions for you. Four targeting modes (nearest target, farthest target, strongest target, and continuous range) enhance detection in tough light or weather conditions. Weatherproof GORE-TEX® membrane protects the already rugged housing. Powered by one CR-123 battery (included). 5.2”L x 4.5”W x 2.1”H. Wt: 14.4 oz. Maximum range: 2,500 yds. Beam divergence: 1.5 x 3.0 MRAD. Cancer and Reproductive Harm- www.P65Warnings.ca.gov.